We had perfected the cranberry apple crumble last winter by modifying this recipe, but then I never wrote down our modifications. Last night was our first cranberry apple crumble of the season and we are still puckered from the tartness. Modified version below, to remind ourselves..
Coarsely chop a bit more than ½ cup of walnuts in food processor by pulsing 5 times with Chop function. Set nuts aside in small bowl. Add flour, brown sugar, cinnamon, and salt to food processor – use Stir function. Add in butter with Mix function until large clumps form, then Stir in chopped nuts. Chill until ready to use. Stir together apples, cranberries, brown sugar, flour, cinnamon, salt, and lemon juice in a large bowl. Preheat oven to 425°F with rack in lower third. Transfer fruit filling to pie shell. Loosely cover with foil and bake until apples droop slightly, about 35 minutes. Reduce oven temperature to 375°F. Sprinkle crumble topping over filling and bake, uncovered, until crumble is browned, filling is bubbling, and apples are tender, 40-55 minutes more. Cool completely, 2 to 3 hours. The Thai red curry recipes from Rasa Malaysia and Steamy Kitchen are drastically different. After going through a whole jar of red curry paste, we have developed our favorite version from both recipes. In a medium saucepan, sautee 2.5 tbsp red curry paste in olive oil over medium heat until aromatic (~2 min). Add ½ can coconut milk and whisk into the curry paste, so the curry paste breaks up. Add ¼ can water (or clam juice). Add ¼ tsp fish sauce and 2 tsp sugar. Add vegetables, meat or seafood once curry is simmering. Add the items that take longest to cook first, then add the quick cooking items, so as not to overcook them. Cook until vegetables, meat or seafood is done. My favorite dish, only quicker! Modifications made, original recipe from Cooks Illustrated. 2. Heat oil and saute onion, tomato paste and ½ tsp salt; cook until softened. Stir in garlic and red pepper flakes; cook unti fragrant. Stir in tomatoes and gently simmer, stirring occasionally for 10 mins or until tomatoes no longer taste raw. 3. Stir in water and vodka, then add pasta. Cover, increase heat and cook, stirring often and maintaining a vigorous simmer until pasta is done. 4. Stir in cream and heat through; stir in basil and season. Stir in sauteed veggies (optional). Serve hot. After having my first quiche in Paris about a week ago, I decided to make my own! I read about a dozen recipes before mashing it up and making my own version.. With a ready-to-bake pie shell, the quiche took about 15 minutes to put together, 30 in the oven, then my mouth! I made two and one is going into the freezer. It’s spring and asparagus is in season! I went nuts in Chinatown when I saw that the most beautiful asparagus was only $0.79/lb and bought two huge bunches. Then I had to decide what to do with the asparagus, so the first night I made a tomato sauce with zucchini, onion, mushroom, asparagus and kielbasa sausage for my spaghetti. Plenty of sauce was left over and this brunch was born. 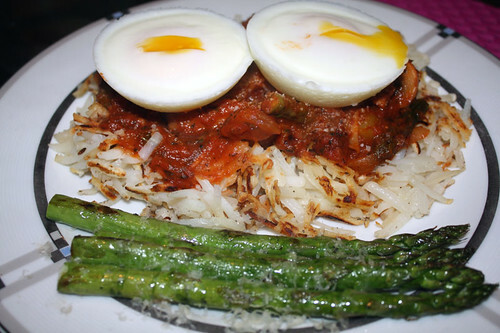 Hash browns topped with the pasta sauce, finished off with two poached eggs and roasted asparagus with a sprinkle of Irish cheddar. What do you do when both you and your roommate bring home 2 dozen eggs each? Go egg crazy and make eggs three ways! I made 15 more Chinese tea eggs as my first attempt to use a lot of eggs. Yum! I’ve read many, many recipes for eggs en cocotte, but never made them before because I rarely have heavy cream in my fridge. This Saturday morning, I did, and I had a friend coming over so I decided to try it based on what I remembered. I like that eggs en cocotte is a true “leftover” recipe – you can use whatever leftover veggies or light dish you have on hand and just add an egg. In this case, I sauteed some spinach, mushrooms and a leftover onion and put them in a small Pyrex bowl. Topped with 2 tbsp’s heavy cream, some Irish cheddar (my new favorite cheese – way better than parmesan! 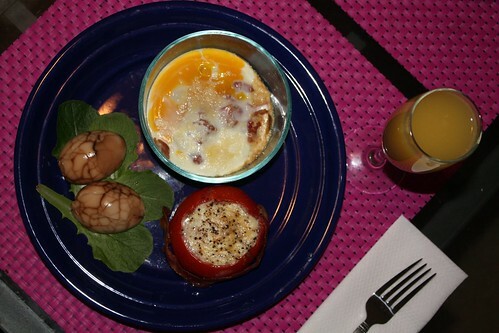 ), cracked an egg on top and put it in the oven. I wasn’t really sure why the recipes say you have to add heavy cream, but once you try it, you’ll never go back. The heavy cream added a creamy flavor to the veggies that paired well with the baked egg. I also didn’t add any butter to my recipe, so it felt healthier. Loosely based off this recipe, I picked up two large tomatoes, hollowed them out, cracked an egg in each, topped with a little Irish cheddar and baked. Tomatoes are up there on my list of favorite foods, next to eggs, so this was the most delicious dish to me. The egg whites were loose, but not runny – perfectly cooked in my opinion. Next time, I’m going to rub the inside of the tomato with pesto before baking, which should give it more flavor. Again, no butter or oil in this recipe, so it tasted healthy to me (besides the fact that I ate 3 eggs for brunch). On a recent visit to SF Chinatown, street vendors were selling Chinese tea eggs as a Chinese New Year specialty. I decided to make my own as a treat for myself since eggs are one of my favorite foods. I adapted from a few recipes I saw online and came up with my own method for the recipe. I love eggs and eat them like candy if I can’t help myself, so I decided to up the recipe to 10 eggs and soft boil them with my tried and true method – cover eggs in room temperature water in a pot, high heat for 10 minutes, then rinse eggs under cool water. The main variation in my recipe was inspired by my desire to multi-task. The longer you simmer the eggs, the more flavorful they get, but I wasn’t about to sit around for 2 hours watching the stove and adding more water to my simmering egg + tea leaf mixture, so I bought the tea leaf mixture to a boil and threw everything into a crock pot (slow cooker). 15 hours later, I had the best tea eggs I’d ever tasted – the yolks were infused with the flavors of the tea and spices, while the whites were perfectly marbled and pretty (my friends think it looks like a dinosaur egg in my photo). Storing the tea eggs is important, too. I didn’t want the eggs drying out, so I put them into a large glass jar and covered them with the remaining liquid mixture. This way, as they keep in my fridge, they will derive more flavor from the liquid! The tea eggs are delicious as a snack or in ramen and I love how they look. I’m keeping the leftover liquid for my next batch.